Sessions Chiropractic Clinic employs both time-tested holistic methods and state-of-the-art technologies to provide you with a complete range of beneficial chiropractic therapies. Because each individual can have a different response to a given treatment, and methods that work wonders for some may not be right for others, Sessions Chiropractic Clinic will consult with you to evaluate your unique condition and determine the true origin of your pain. By treating the cause rather than the symptom, we get to the root of the problem and get you firmly on the path to improved and lasting health and well-being. All of our treatments are approached with the understanding that the human body is miraculous in its ability to heal itself, and is prone to do so if unimpeded by negative outside influence. Determining such causal factors, which can be anything from repetitive stress injury caused by improper sitting, to poor diet, smoking and even unhealed trauma from years past, helps us to lay the foundation for your recovery. Get Back in the Flow! Many ailments originate from a breakdown in the elaborate network that is our central nervous system – brain, spine and nerves, which work in unison to regulate all bodily functions. This is why chiropractic care is deeply focused on the alignment of the vertebrae that make up the spinal column. When properly aligned, the constant flow of electrical impulses proceeds without disruption, working in concert with every aspect of your physical being, from your internal organs to your fingertips. Spinal decompression is used to create a distractive force to relieve pressure on the nerve roots by taking pressure off the discs and joints therefore enhancing the natural healing process by increasing circulation, increasing mobility and decreasing inflammation. The Triton traction device provides a treatment in static, intermittent, and cyclic distraction forces to relieve pressures on structures that may be causing pain of skeletal or muscular origin (cervical, thoracic, lumbar, hip, wrist, shoulder). Therapeutic distraction can be applied in a variety of programmable patterns, cycles and functions. 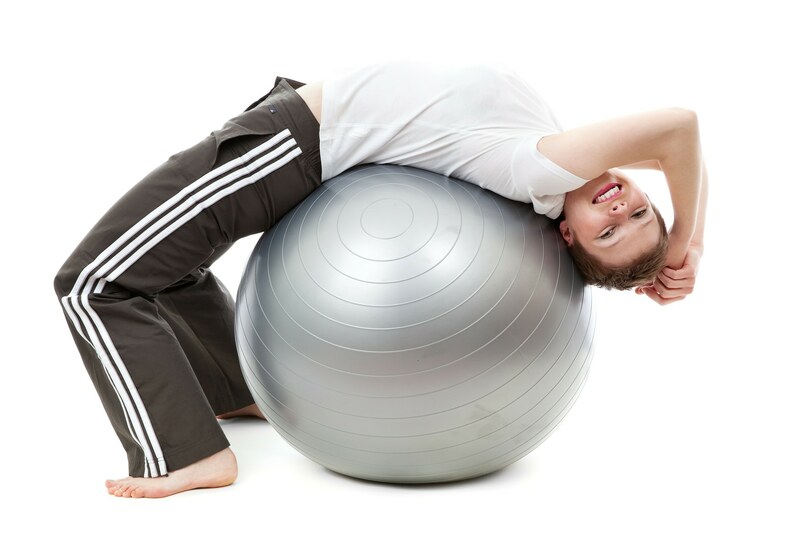 Progressive traction refers to a traction phase during the treatment when the tension gradually increases. Regressive traction refers to a traction phase during the treatment when the tension gradually decreases. TX (Traction) refers to the type of traction used during a treatment. There are three modes to choose from: static, intermittent or cyclic traction mode. The term “step” refers to the increment in which the traction tension is either increased or decreased during therapy. This term denotes that a steady amount of traction is applied for periods from a few minutes up to 99 minutes. The shorter duration is usually coupled with more tension. 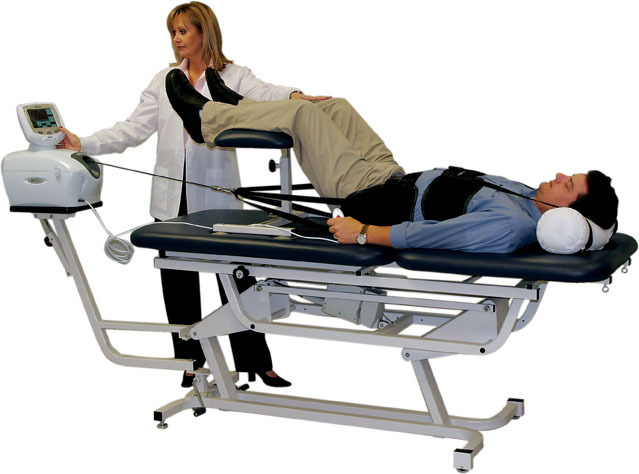 Static lumbar traction is most effective if a split table is utilized to reduce friction. It is important that it is the type that maintains constant tension. This way, any slack developed as the patient relaxes during the traction therapy is automatically taken up and the desired amount of traction is maintained. Static traction is sometimes referred to as sustained traction. This form of traction alternates traction tension levels – maximum and minimum – every few seconds throughout the timed treatment. It is also most effective if a split table is used to reduce friction when giving lumbar traction. In the progressive and regressive phases, the traction unit pulls to the calculated tension, holds for the set hold time, then drops to 50 percent of this tension, holds the set rest time and then repeats this step for the number of steps selected. However, once the minimum level is reached, the traction unit uses the minimum level for the rest time. Cyclic traction refers to progressive and regressive phases of the traction program being repeated continuously throughout the entire course of the traction treatment. Spinal decompression is used to create a distractive force to relieve pressure on the nerve roots by taking pressure off the discs and joints therefore enhancing the natural healing process by increasing circulation, increasing mobility and decreasing inflammation. The device we use is called the Chattanooga Triton DTS traction system. This procedure is becoming widely regarded as an effective approach to treating disc problems, spinal stenosis, disc degeneration, and sciatica. During the session, the patient will experience several cycles of stretch and relaxation. Many individuals benefit greatly with a few sessions. This procedure can also be used for maintenance of non-disc conditions for generalized stretching. DTS Therapy is a leading non-surgical alternative to surgery. You may have relief of chronic debilitating low back or neck pain, which may shoot pain into the legs, buttocks and arms. The DTS Therapy is helping thousands of people, who just like you, thought they would never eliminate the pain associated with simple tasks, such as getting out of a chair or up and out of bed. No drugs are involved and no serious side effects have been reported with DTS Therapy. Whether you are in recovery from an injury or simply long to decompress from the stresses of daily living, massage therapy can provide remarkable benefits to the body and mind. Sessions Chiropractic Clinic offers a variety of massage types depending on the needs of our patients. Treats Myofascial Pain using Pressure on Sensitive Points. Schedule a professional massage with Sessions Chiropractic Clinic today. You are certain to leave feeling much better than when you arrived! If everyone were in perfect health and completely free of pain, Sessions Chiropractic Clinic might not be in business! Nevertheless, we do take pride in educating our patients on how to achieve and maintain optimal health and pain management. A good diet and a healthy lifestyle, including exercise, have an inexorable link to your sense of well-being, both physical and mental. 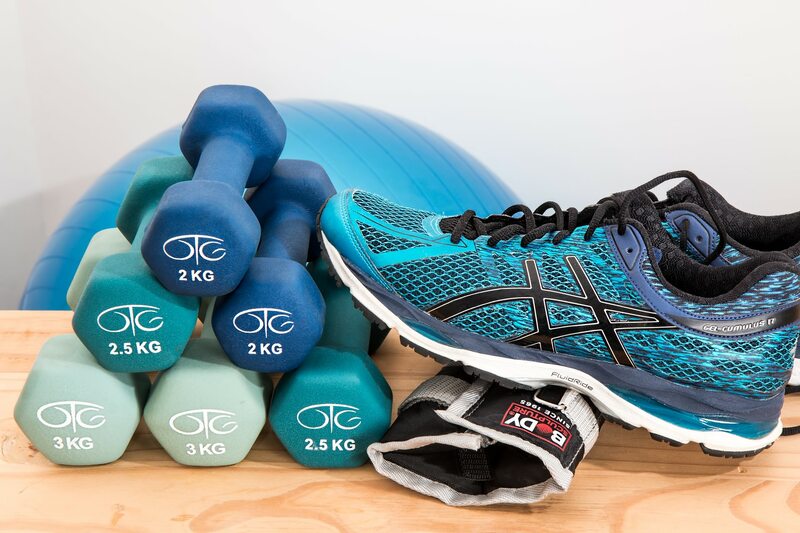 Sessions Chiropractic can help you to create a regimen for meals, nutritional supplements and exercise customized to your current needs and future aspirations. You will see a positive and lasting impact on your quality of life! Request an Appointment today to get started! Anyone who’s lived with chronic pain for any length of time knows how it can dominate your day. It can slow you down, impinge upon your goals and even damage social relationships by making you tired and irritable. Depending on the source of your pain, Sessions Chiropractic Clinic may be your primary source of treatment and relief, or we may work as part of an interdisciplinary team which includes your other medical practitioners. In either case chiropractic and massage therapy are now widely regarded as valuable and legitimate tools in the arsenal against chronic and acute pain management. Sessions Chiropractic Clinic uses a multi-faceted approach to help your body conquer pain naturally, without toxic medications or invasive surgery. Just as there are many types and causes of physical pain, there are many approaches to its treatment. Sessions Chiropractic Clinic specializes in pain management, always with the goal of helping you achieve a pain-free life. Through a combination of massage, which targets the muscular system, and chiropractic therapy, which targets the skeletal system, we can help your body to heal itself and stay healthy. A truly holistic approach to living involves your personal commitment to beneficial dietary, exercise and sleeping habits as well. The good news is that your body wants to be healthy, so don’t be surprised to find yourself craving things that are good for you! We’re quite proud to maintain so many rewarding, long-term relationships with our clients.